Today April 13, marks 100 years of the Jallianwala Bagh massacre which will remain to be one of the darkest hours of British colonial rule in India. 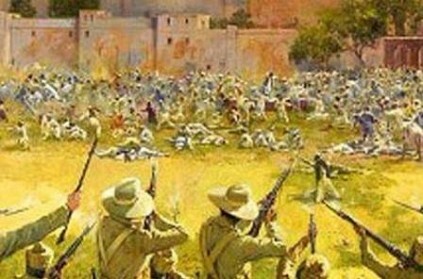 On this day, hundreds of people were killed by troops under British Brigadier-General Reginald Dyer, during a peaceful meeting at the park in Punjab's Amritsar city. This fateful incident happened in 1919, where at least 400 people were killed after some 50 British soldiers opened fire within the walled enclosure in Jallianwala Bagh. Brigadier Dyer arrived at the garden with dozens of troops, who closed the exit and without warning ordered the soldiers to open fire. Several tried to escape by scaling the walls of the garden, some others jumped into an open well as troops continued firing. According to an eyewitness, "heaps of dead bodies were left at the sight". Till today the walls are torn with bullet marks from 100 years ago. Since morning, the nation is paying homage to the martyrs of the Jallianwala Bagh massacre by remembering them from the bottom of their heart. President Ram Nath Kovind, Vice President M Venkaiah Naidu and Prime Minister Narendra Modi took to social media and paid tributes to the martyrs of the incident. Later today, the Vice President will also release a Commemorative Coin and Commemorative Postage Stamp. Meanwhile, Congress President Rahul Gandhi also paid homage to the martyrs at the memorial. This massacre which is a symbol of colonial cruelty was condemned by British Prime Minister Theresa May earlier this week in the parliament. She referred to the tragedy as "shameful scar on British Indian history". ராமலீலையில் ராவணனாக நடித்தவர், அமிர்தசரஸ் ரயில் விபத்தில் பலியான சோகம்! தசரா: ராவண கொடும்பாவி எரியும்போது புகுந்த ரயில்..50-க்கும் மேற்பட்டோர் மீது மோதி விபத்து! This page contains news relating to various facts and events. The views are generally about current affiars and general topics in diversified areas such as political, international, national, and regional issues, sports, health, travel, lifestyle, technology and business. People having similar interets on the above topics will find this page useful. Nation remembers Jallianwala Bagh massacre on it's 100th anniversary | India News.